I am now well and truly settled in with the Our Far South team who have really made me royally welcomed. As I write my ribs are still sore from laughter incurred as a result of the ‘Hawaiian evening’ last night. Amazingly they all work as hard as they play and a lot is going on every day and in many different disciplines. In my last blog I wrote about the threats to seabirds from a number of factors; one of which is fishing. Here I’ll try and tell you what we have found to be successful in reducing fishing related captures. Trawling and long-lining are two common methods of commercial fishing that cause problems around New Zealand. There is increasing evidence that methods used by recreational fishers like inshore line fishing and shallow water set netting also cause seabird deaths. To some extent what we do it is dependent on the type of fishing method but generally the underlying principles are the same. 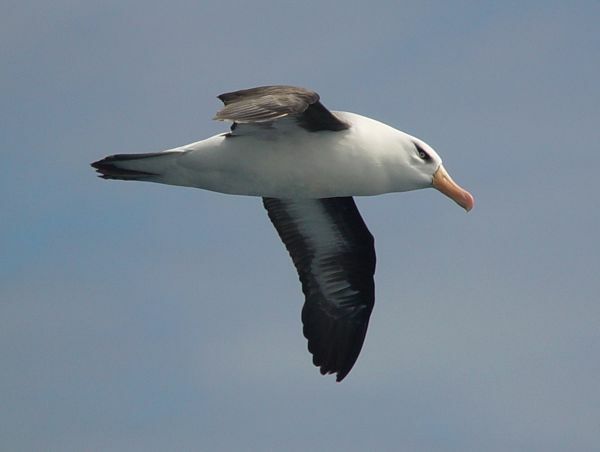 So how can we stop seabirds being killed as a result of fishing? The universal principles of hazard management can be applied to this problem as well – isolate, minimise, or eliminate. Removing the threat is obvious – an example of this the fishmeal plant on San Aotea II meaning that nothing edible goes back over the side. 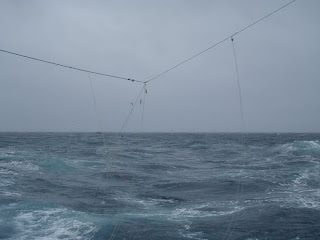 When using the longlining example (although the principles are relevant to other fishing methods,) isolation and mitigation translate into methods that either scare birds away from the danger zones near vessels that are actively fishing, or moving the attractant food away from these areas, either by changing their location or by the retiming of some operations. The most effective solutions tend to be simultaneous combinations of a number of these different techniques. hooks as they are set is most important. Our main marine version of a scarecrow is the streamer line (also called the tori or bird line). This is generally a rope of relatively thin diameter (think clothesline,) with a bit of heavy mooring rope or similar at the end to create drag which is towed behind a boat. The main line is generally quite long – say 200 metres. Hanging off this, like washing, are a number of paired streamers made of coloured plastic tubing spaced out close enough to be effective and cut so that they reach from the line to the water – the streamer line obviously angles down to the sea surface from the stern of the boat. When deployed the streamers move about in the wind and scare the birds. The best systems allow this streamer line to be pulled one way or the other across the stern of the vessel in order to sit directly over the line as it is being set as wind and tide can affect this location. ‘Jigglers’ that shake the line physically and the use of an extension pole to one side of the vessel which also creates a ‘wall’ near the area where the baits first enter the water are enhancements. In ice-free waters an arrangement similar to this is used about the hauling area (a curtain) to keep birds away from baited hooks as the line is hauled back up. We also have noise-making devices such as the gas powered cannons used in orchards and vineyards. The most effective way of reducing seabird mortality, by minimising the danger, is making sure the baited hooks sink quickly out of the diving range of birds. Weighted lines are the best method – our New Zealand fishing industry has worked closely with suppliers to develop a longline backbone (the rope that the hooks are attached to) with lead weights embedded in it to make it sink quickly. This is now widely used and is a safer and more effective solution than our previous technique of tying larger weights onto the line at intervals. Timing the release of fish waste and bait is also very important in minimising seabird captures. Although this is not an option south of 60° S due to the CCAMLR regulations on offal discharge, in other fisheries this is a very successful technique. Best carried out from the side of the vessel away from the hauling area and most effectively when no hooks are coming up it means that birds will get their feed in safety. Some object to this approach on the basis that it will teach birds that vessels fishing are food sources – to my mind we are well past that stage and are better off managing the, by now, well learned behaviour. Setting lines only at night when visibility is poor is another option, although down here in the Ross Sea in summer this is obviously not an option as it is always light. To my mind one of the most important factors is the commitment of the skipper and senior crew on each boat to reducing seabird mortality - other crew take their lead from those they respect. I have seen us make huge progress in the elimination of seabird catch over the last decade but this does not mean we have solved the problem or can afford to be complacent. All of us who fish, whether as a business or for pleasure, have a duty to fulfil. It’s a problem we can fix. Next blog – the Antarctic toothfish.